He was planning to work with animals. Undecided about his major, Steve Bergeson '76 took an interim course in rural Minnesota during his freshman year, and afterwards decided to become a veterinarian. His roommate, who was from Ethiopia, believed God had gifted Bergeson to minister to humans, and eventually Bergeson believed it too. But it wasn't until the interview process at veterinary school that god finished the work to change Bergeson's mind. "Medicine has been a great fit for me," he says, "and has given me opportunities to serve." Serving is very important to Bergeson. 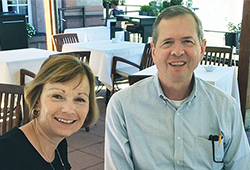 He and his wife Kelley have served in healing professions for many years, Steve as a physician at Allina Health's clinic in Shoreview, Minnesota, since 1983, and Kelley as a chaplain at Lyngblomsten Care Center in St. Paul. Bergeson also served the Bethel community as the university's campus physician for 10 years. At the time, he had a young family and was involved in multiple leadership roles, but he made time to minister to students and their parents. He diagnosed quite a few colds and sore throats, he says, but also helped some families facing the crisis of life-threatening illness, and found it proved both "challenging and rewarding to serve Bethel in this way." During his time as Bethel's physician, Bergeson was approached by Professor of Chemistry Dale Stephens, "a cherished professor who had a profound impact on my learning and life," says Bergeson. "Dr. Stephens said something like 'It's time for you to start giving back,' and he challenged me to begin a scholarship. So the Class of '76 Scholarship was born." This endowed scholarship [LINK to: new "Endowed Scholarship" page] is designed to help a chemistry student with financial need who might not otherwise be able to attend Bethel, and many graduates from the class of 1976 have contributed to it. The scholarship has continued to grow over the years and has benefitted 19 students so far. Now the Bergesons have found another way to serve Bethel students for generations to come. They've updated their wills to reflect their passion for preparing students to serve God in their chosen vocations, just as the Bergesons have done in their own work lives. "Our hope is that our funds will serve to train disciples who will go into the world and use their vocation to glorify God-even worship Him-in their work," says Steve. "The world is searching for truth and is often hostile to the gospel, so vocation is a mechanism by which some who would never attend church will encounter God." Bergeson doesn't necessarily see the couple's financial contributions as a legacy. To him, the real legacy "is getting up every morning, asking a blessing as one leaves the house that Christ will be honored in our vocation, and doing whatever we do for His glory every day," he says. "My challenge to Bethel is to continue to train graduates to live out the reality of God's kingdom in their vocations and in the common, everyday aspects of life."